Quality paper for a consistent message! To ensure a consistent look and feel, we use the same brand and weights of paper for continuation sheets as we do for our letterheads and print them equally as beautifully. Whether or not you request a proof, all supplied artwork files undertake our rigorous 10 point file check to ensure your printed job turns out exactly as you intend. Files are automatically impositioned ready for printing in the most effective way to minimise waste. A high quality FOGRA colour-matched proof is produced for the printer to ensure colours are printed as close to the file requirements as possible. Flexpress Continuation Sheets are printed onto an environmentally friendly 'A' grade branded paper that is fully approved by the FSC (it's actually the same brand of paper we use ourselves) so you can be sure of a consistent look and feel but more importantly problem free overprinting every time you order. Every job at Flexpress is printed using the finest technology available. You wont receive any products printed on beefed-up photocopiers from us - another reason we back everything with our total satisfaction guarantee. 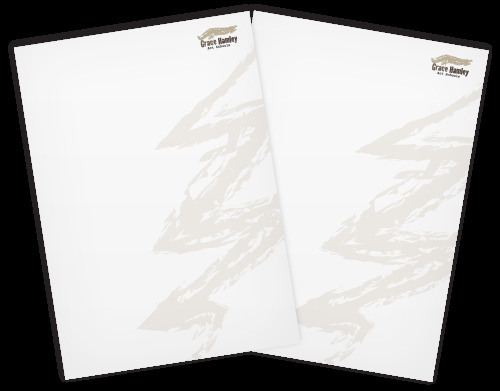 Our Continuation Sheets are printed lithographically using LED UV inks so whatever type of printer your client uses, you can be sure they won't smudge, smear or jam. Our Continuation Sheets are trimmed using highly accurate programmatic guillotines. This ensures that even those with tight borders are cut accurately. They're packed in extra-strong, double-walled, unbranded cartons that will stand up to the rigours of national carriage.